Melody’s original bridal bouquet was stunning. It included a wide variety of flowers, including some picked from her florist’s garden! When you have a wide variety of flowers, it can get a little tricky to have your bridal bouquet recreated in silk flowers. But with Melody’s help we found a list from the florist and I played a little “I Spy” with her photographs and we came up with a design that included almost all the types of flowers and maintained the overall look. See for yourself! 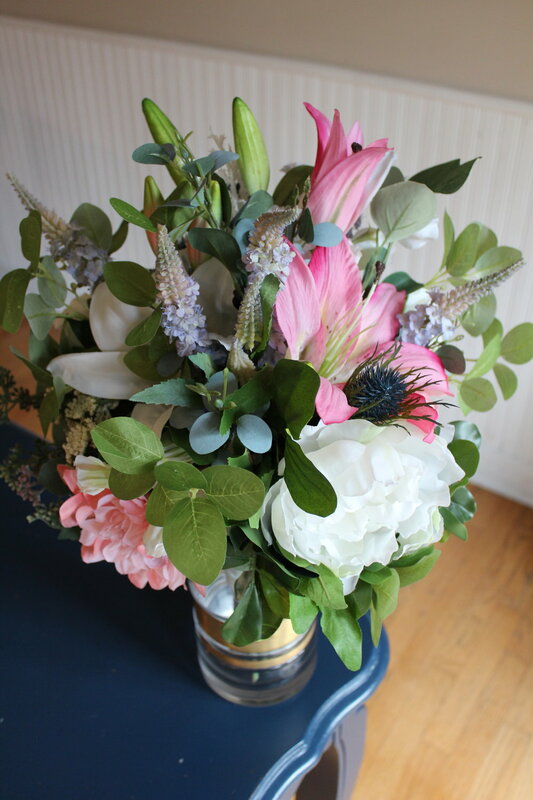 Thistle, Lilies, Veronica, Peony, Dahlia, Astilbe, Queen Ann’es Lace, Sweet Pea, Eucalyptus, Bay Leaves, Rose Greens. 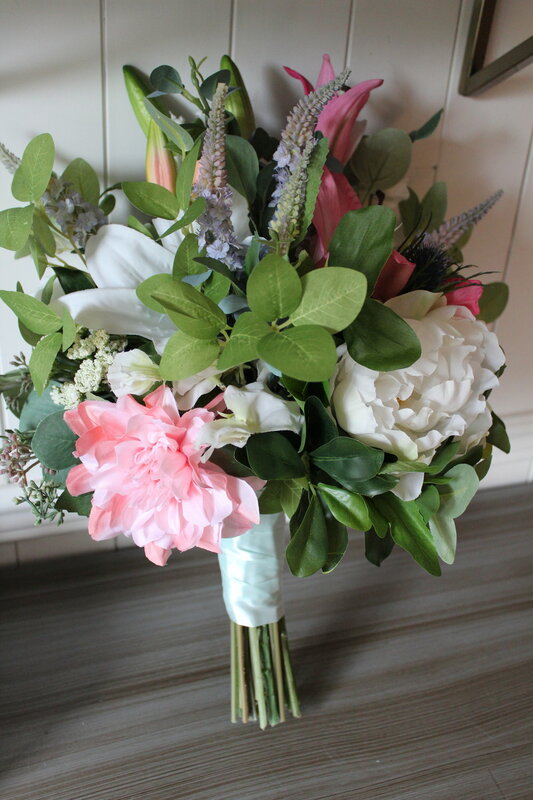 Here’s a photo of Melody’s original bouquet- doesn’t she look beautiful and happy?? Her talented photographer was Nicole Anne Photography, check her out if you live in Canada. I love to show side-by-sides to give a sense of the original and the recreation. I was able to find a very light blue satin ribbon (her something blue) to tie off the handle. 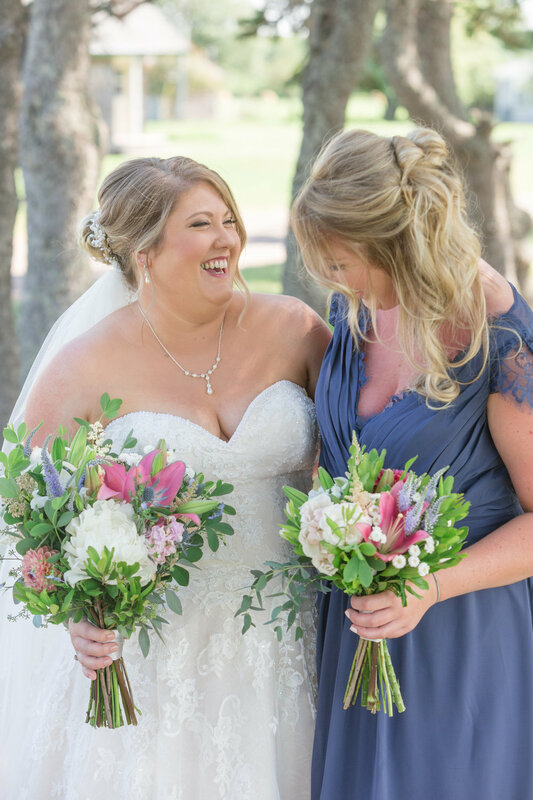 Whether your bouquet was lush and layered like Melody’s or simple and classic, a bridal bouquet recreation in silk flowers might be the perfect gift or meaningful piece to add to your home decor. Contact me to find out how to have your bridal bouquet recreated today.